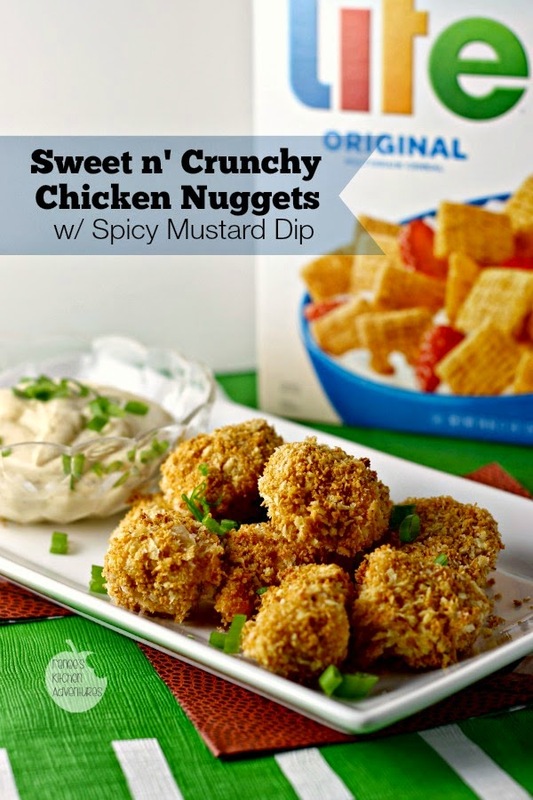 Quaker® Life cereal provides the sweet crunch in these delicious baked chicken nuggets. The spicy mustard dip takes them over the edge and compliments the flavors perfectly! I know what you are thinking...breakfast cereal on chicken? If you are able to "think outside the box" for a minute, you'll see that this combination is seriously amazing! These little gems are so crunchy, you'd swear they are fried, but they're not! Quaker® Life cereal helps keep the breading super crispy The fact that they are baked helps make them a better-for-you snack perfect for the big game, afternoon snack or kid-friendly dinner! I've loved Quaker® Life cereal for as long as I can remember. When I was a kid, my brothers and I pretty much lived on cereal. My mom was a single working mother, so cereal really helped stretch the food budget. I have fond memories of going to the store and being able to pick out a box cereal for the week. Quaker® Life cereal was always a favorite choice for me. It made a great breakfast, quick lunch, after school snack and the occasional impromptu dinner. These chicken nuggets are definitely kid friendly! The lightly sweet Quaker® Life cereal, with it's whole grain goodness, makes a great breading. Adults will appreciate the Spicy Mustard Dip to give your palate that wonderful sweet/spicy flavor profile. Let me tell you how I put this recipe together. This recipe has a few steps, but it comes together pretty quickly. Start by measuring out 1 1/2 cups of Quaker® Life cereal. 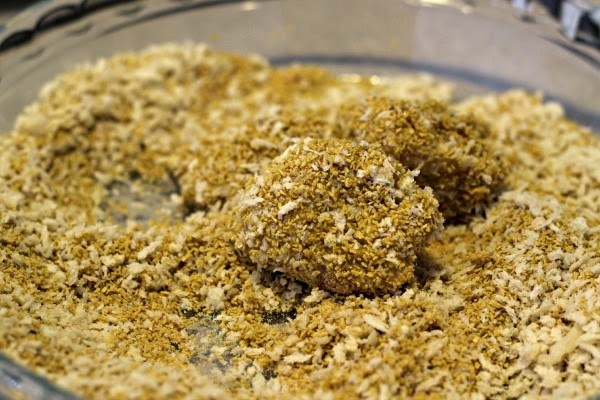 Once the cereal is ground into fine crumbs, add some panko bread crumbs and seasonings to make the "breading" for the nuggets. and place on an oven safe rack, that has been sprayed with cooking spray. Spray the nuggets with cooking spray and pop into a 425 degree F oven for 10- 15 minutes. 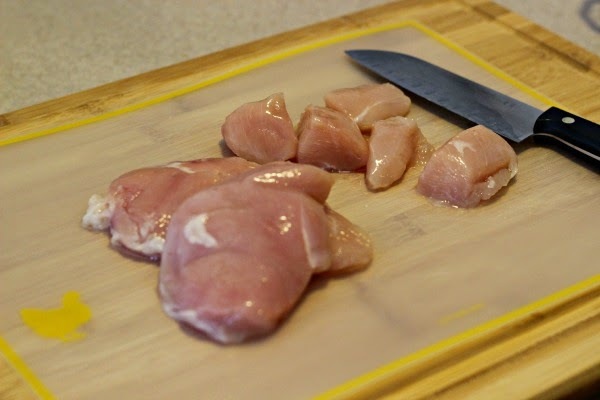 While the chicken is cooking, whisk together all the ingredients for the spicy mustard sauce. You will want to give this one a try! 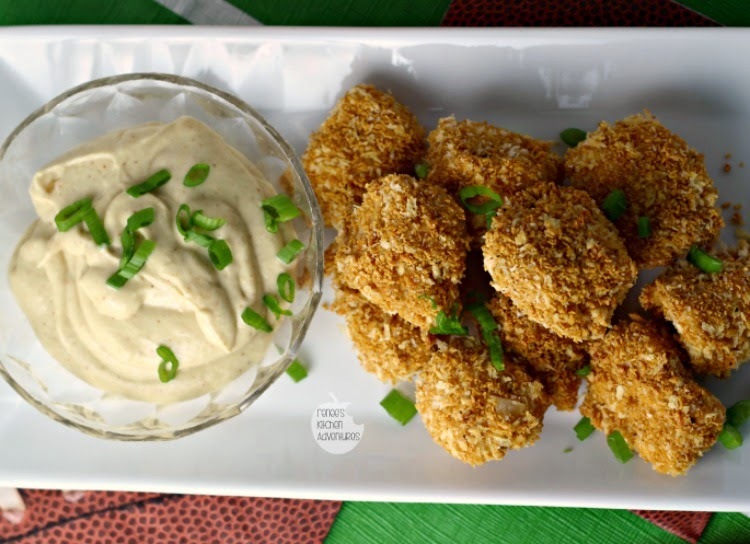 We all loved these nuggets at our house and I know this recipe will become a family favorite. Sometimes it's so fun to find new ways to enjoy foods we've grown up and loved for years. Of course, I will still enjoy a bowl of Quaker® Life cereal in the morning with cold milk or a handful, eaten straight up, in the afternoon because it's like an old friend that reminds me of my childhood. How about you? How will you enjoy Quaker® cereal? 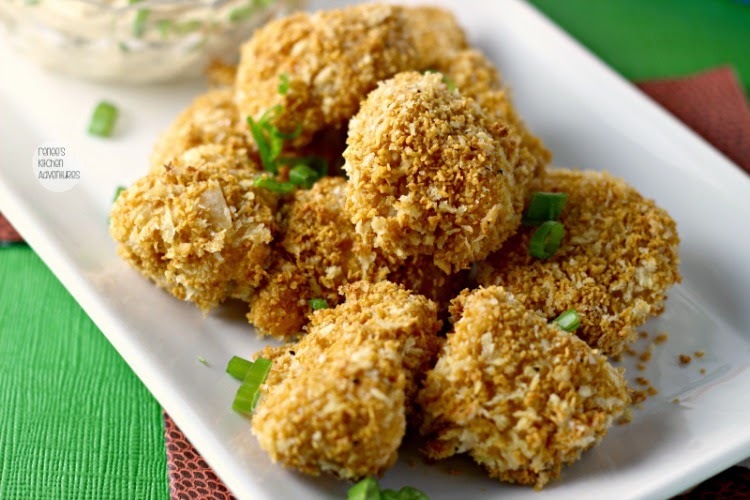 Sweet and crunchy these baked chicken nuggets are a crowd pleaser. The Spicy Mustard Dip compliments them perfectly! Preheat oven to 425 degrees F. Line large baking sheet with foil or parchment (for easy clean up). Place oven safe rack onto prepared baking sheet. Spray well with cooking spray. 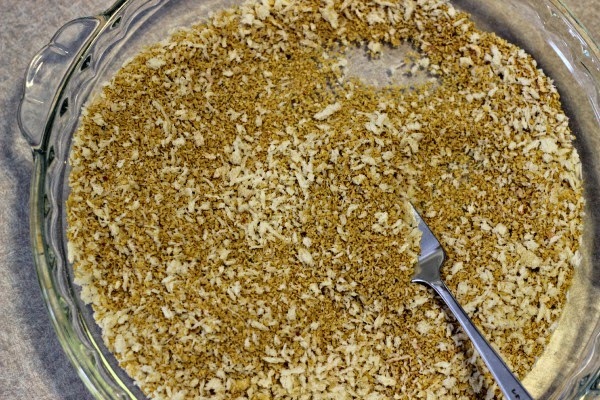 In food processor, grind up Quaker® Life cereal until fine crumbs. Set aside. 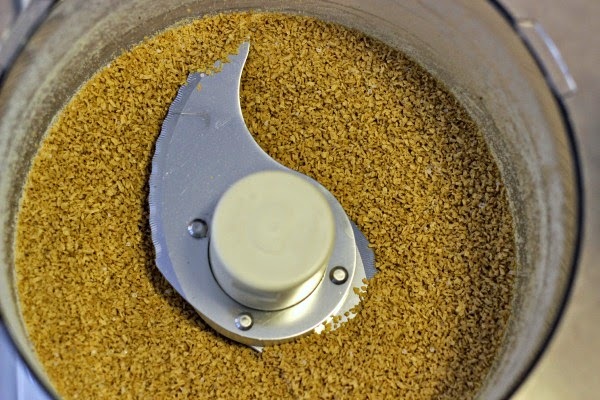 In large shallow bowl or pie plate, combine the cereal crumbs, Panko, onion powder, garlic powder, salt, pepper and smoked paprika. Mix with fork to combine. Add flour to a small shallow bowl. Add egg substitute to another small shallow bowl. 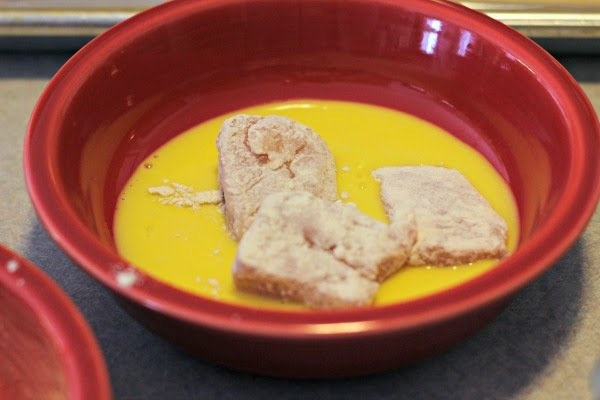 Set up a breading station with flour, egg substitute, and "breading" mixture. 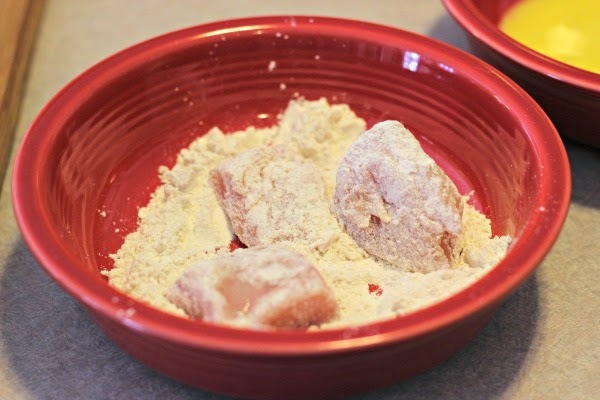 Dredge chicken pieces in flour, then egg substitute OR egg, and then in "breading". Place on prepared rack. Spray nuggets well with cooking spray. 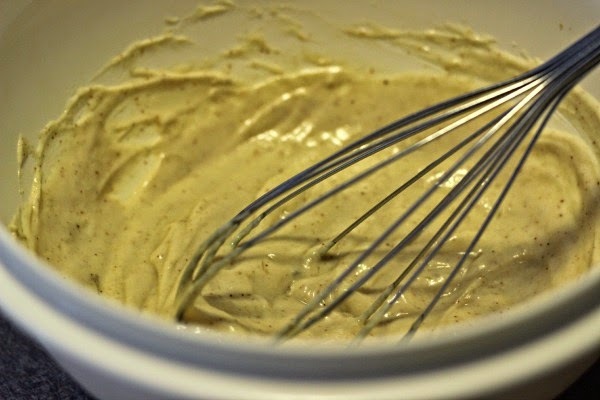 While chicken is baking, whisk together all ingredients for Spicy Mustard Sauce in small bowl. If desired, reserve some green onion for garnish. Do you pin? 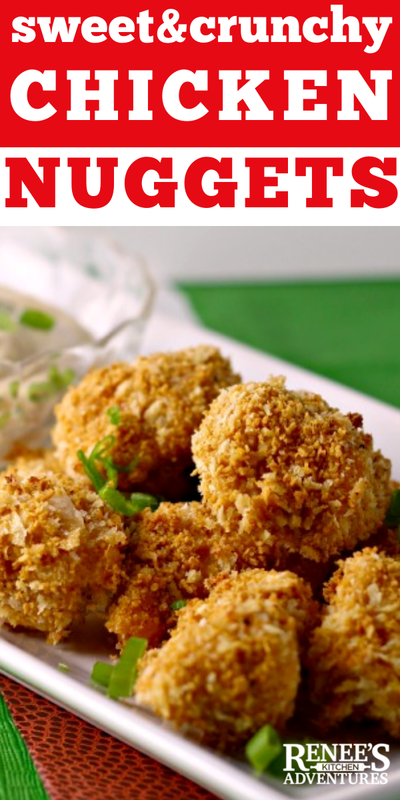 Don't forget to pin this recipe for Sweet N Crunchy Chicken Nuggets to your Pinterest boards! You get me with the mustard dipping sauce. I am all about that - and your ingredients look interesting for it too - cider, Worcestershire. Great recipe all around! My daughter just looked over my shoulder and said "you should make those" :-) I almost always have Life Cereal in the house. 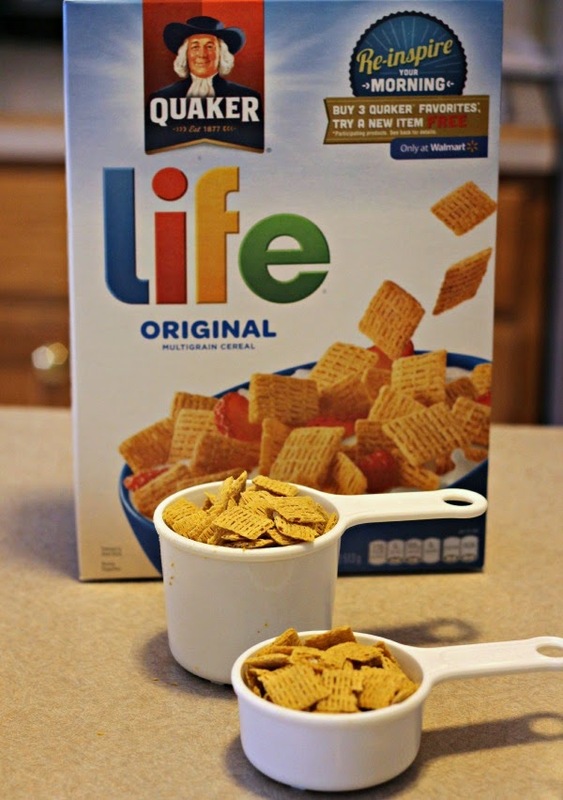 This is such a creative recipe using Life cereal!! I know I'd love it. Yum! Love how crunchy they look. They totally look fried! Clever idea for a super healthy, high protein snack. Who knew Life cereal would make a great breading for chicken??! This looks great! I love this idea Renee! I'm always looking for healthy dinner ideas. 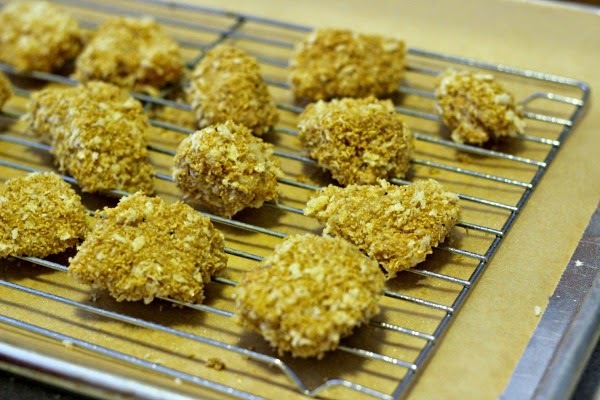 This is such a clever idea for breading chicken nuggets! :) And I love that these are baked. Simply brilliant recipe! Life has been my favorite cereal for a long time. 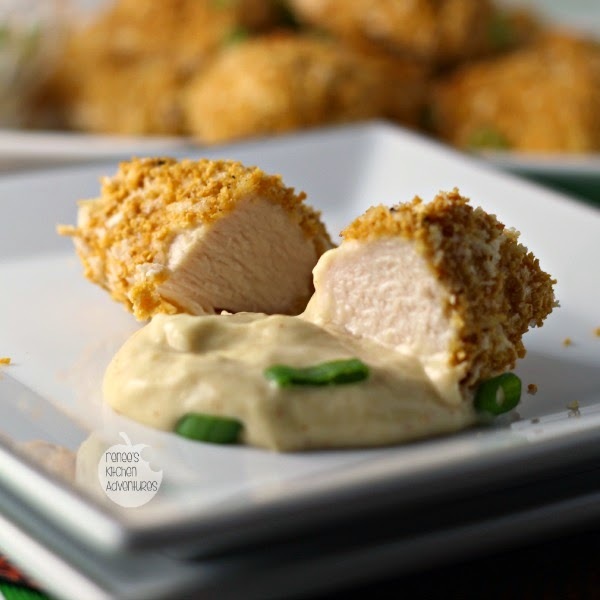 Crunchy and baked chicken! I'm all over this!! I love using cereal as breading for chicken! This looks so yummy. My tummy is growling. What yummy crunchy chicken! I have to make that Spicy Mustard Dip!